Tel Bet Yerah (Khirbet el-Kerak) is probably the most intensively excavated Early Bronze Age site in Israel with the exception of Arad. Eleven major expeditions between 1933 and 1986 and many minor ones have excavated an aggregate area of as many as 10,000 square meters, revealing a continuous sequence spanning all known phases of the EBA (See Greenberg et al 2006). The lengthy occupation sequence begins with scattered village settlement in EB IA (3650-3500 B.C.E.) and ends after the collapse of the EBA town in what may be termed final EB III (24th century B.C.E.) (2 10 11). The original mound of Tel Bet Yerah was a tongue shaped peninsula bordered by the river and the sea. It had been long inhabited by the end of EB I and its is not unlikely that its prosperous inhabitants constructed some rudimentary fortification across the edge of their peninsula (15). But in EB II a significant change took place and walls, streets and houses became integrated into an urban whole (10). Although the name of the Early Bronze Age city is unknown the name "Bet Yerah", first mentioned in the Talmud, could preserve an ancient tradition connecting the Canaanite site to a moon deity. In the Hellenistic period the city was called Philoteria and somewhat later the name Zinbari (Arabic al-Sinnabra) was associated with the site. In recent generations the mound was known as "The Kerak", a name preserving the memory of the fortified town that once existed there, its ruins still visible (5). 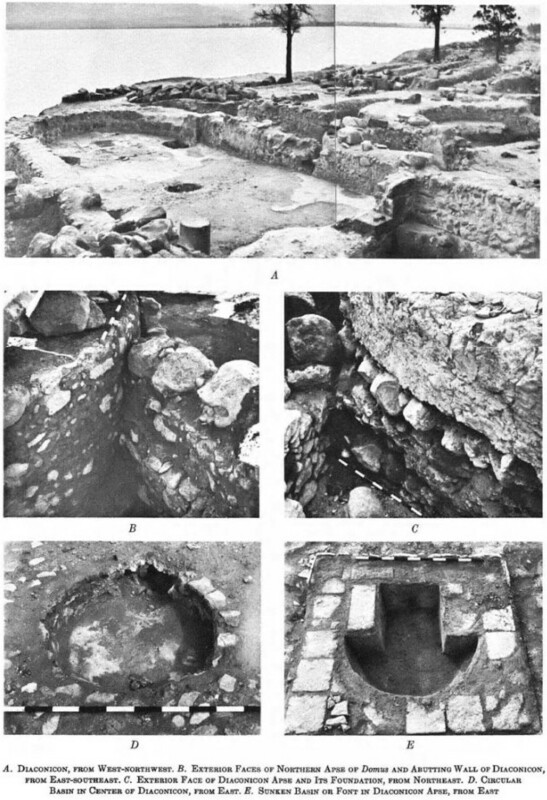 After the decline of the Early Bronze Age town limited parts of the site were occupied in the Middle Bronze Age and again in the Persian -- Hellenistic -- Byzantine and Islamic periods. 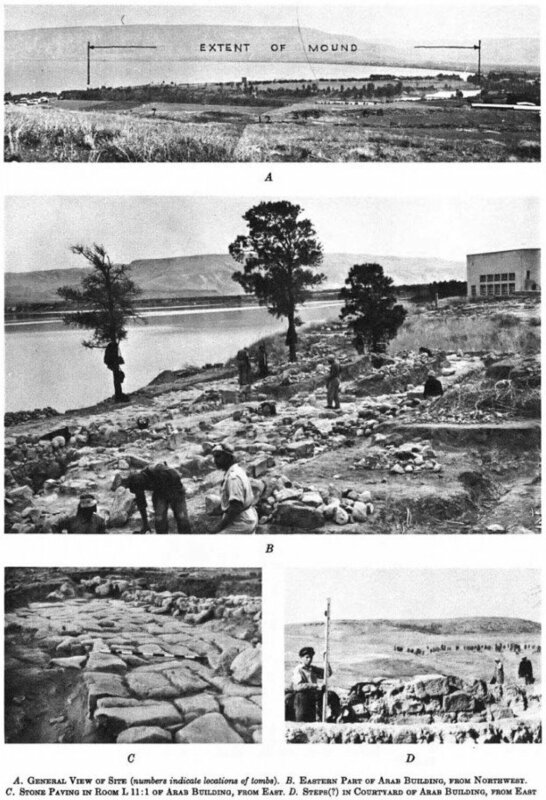 Modern archaeological research on the mound began in the early 1920s when E.L. Sukenik (See The Ancient City of Philoteria 1922) examined finds from the section of the old Samak-Tiberias road that traversed the mound along its entire length. The first archaeological excavation was conducted in 1933 (See A) when the modern Samak (Zemah)-Tiberias highway was constructed (5). In the peninsula formed by the southwestern shore of the Sea of Galilee and the emerging Jordan River the ancient walled city of Beth-Yerah (Khirbet Kerak or “temple of the moon god") was discovered. It was famous for its unusual Early Bronze Age pottery first called by W.F. Albright Khirbet Kerak Ware. Hellenistic remains were found in one section of the mound identified with the city of Philoteria built by Ptolemy II Philadelphus (285-246 B.C.). In this area near the Sea of Galilee the River Jordan has “changed its course since antiquity". The remains of the "Crusader Bridge of Sinnabra" were found in the former river bed. Just south of Beth-Yerah the Neolithic site of Sheikh Ali was discovered where the Wadi Yavneel joins a circular section of the Jordan River. On the other side of this wadi is prehistoric Ubeidiya (Page 1122 1) . The ware consists of a variety of bowls -- kraters -- jars and stands beautifully burnished in red and black as well as unburnished cooking ware and portable hearths; all made in a style and technique clearly alien to the local traditions. 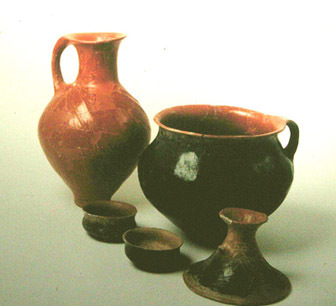 This ware has been linked to groups of Early Transcaucasian migrants who emerged in the Kura-Araxes region and spread to southeastern Anatolia and the Levant during the 3rd millennium BC, producing distinctive ceramics known in Turkey and Syria as Karaz Ware or Red-Black Burnished Ware. At Tel Bet Yerah Khirbet Kerak Ware was introduced at the beginning of the Early Bronze III circa 2750 BCE and was produced in large quantities on-site alongside traditional local ceramics. Production of this ware continued throughout EB III in diminishing quantities and ended with the demise of the Early Bronze Age town. The Hellenistic period covers the period of Mediterranean history between the death of Alexander the Great in 323 BC and the emergence of the Roman Empire as signified by the Battle of Actium in 31 BC. Our knowledge of Philoteria (250-100 BC in 2) as well as the circumstances of its disappearance is minimal (3). The site of Beth Yerah lay on the border of two major phyto-geographical zones. To the west it shared climate and flora with the Lower Galilee. Both enjoyed the rainfall and vegetation of the Mediterranean zone. The area south and east of the tell was in the Irano-Turanian zone. This steppe-like territory allowed seasonal cropping of cereals although the potential yields of these grains was greatly increased when simple gravity flow irrigation was practiced in the alluvial soils. The location at the juncture of two major ecological zones provided the inhabitants of Beth Yerah with a certain degree of security. By being flexible with subsistence strategies they could minimize risk and thus offset variability in rainfall. This was probably done by having a truly mixed economy based on stock raising -- fishing and the cultivation of cereals -- grapes and perhaps olives. It has been suggested that the development of agricultural products was the result of an international demand fostered by the Egyptian upper classes (1). Increasing involvement in this international trade network by the emerging urban elites of Early Bronze Age Palestine thus would lead to an increasing dependence on “cash crops" replacing the more basic subsistence economy documented for Early Bronze Age I.
for these objects, two of which were found at Ai (Et Tell) -- one in the sanctuary and one in the lower city excavated by J. Marquet-Krause (3). It is much more likely however that these votive objects were locally manufactured. Beth Yerah had even more international links. In addition to the material that appears at other Palestinian sites and in Egypt the site has yielded large quantities of the ware that took its name from the site. Khirbet Kerak Ware has a distribution that stretches from northern Palestine through the Orontes Valley and as far north as the Amuq. Not only then is the site located on the margin of two phyto-geographical zones but also its location in northern Palestine places it roughly on the edge of two cultural zones. Beth Yerah thus presents an ideal place to study the interaction between Palestine and Egypt as well as the connections between northern Palestine and Syria. The origin of the ancient name of Khirbet Kerak -- now referred to as Beth Yerah -- has been long and fiercely debated. Although eyewitness observations of the topography of the site date back to the Middle Ages the debate over its classical name began in the early nineteenth century. This debate stemmed from a comment made by Pliny the Elder (The Natural History 5.15) that the site of Tarichēae (actually Magdala 3 1/2 miles north of Tiberias) was located at the south end of the Sea of Galilee and an ambiguous and seemingly contradictory statement by Josephus about the location of Tarichēae in his account of Vespasian's campaign in Galilee in A.D. 67 (The Wars of the Jews 3.447). [444-7] But as soon as he was informed that Tiberias was fond of innovations, and that Tarichēae had revolted, both which cities were parts of the kingdom of Agrippa, and was satisfied within himself that the Jews were every where perverted [from their obedience to their governors], he [Vespasian] thought it seasonable to make an expedition against these cities, and that for the sake of Agrippa, and in order to bring his cities to reason. So he sent away his son Titus to [the other] Cesarea, that he might bring the army that lay there to Seythopous (Beth Shan), which is the largest city of Decapolis, and in the neighborhood of Tiberias, whither he came, and where he waited for his son. He then came with three legions, and pitched his camp thirty furlongs off Tiberias, at a certain station easily seen by the innovators; it is named Sennabris. when they passed it on their trip from Tiberias to Beth Shan in the spring of 1818. We left the hot baths about noon; Moving towards the southern extremity of the lake we observed on our right at the foot of the hills an extensive aqueduct; and at the entrance are traces of the walls of Tarichēae which appears to have been situated on two eminences -- one on the right of our road and the other bordering on the discharge of the lake by the Jordan (4). Although E. Robinson did not visit the site in his 1838 journey to Galilee his use of Pococke's description of Khirbet Kerak indicates that he too thought this large mound held the ruins of ancient Tarichēae. By the time the Lynch expedition made their “naval" voyage from Lake Huleh to the Dead Sea in 1848 the exit of the Jordan River from the Sea of Galilee was firmly assumed to mark the location of classical Tarichēae. W. M. Thomson also took for granted this identification in his publication of his travels (5) as did MacGregor in his canoe trip down the Jordan in 1869 (6). Ancient Tarichēae was not the only ancient site with which the mound of Khirbet Keralt was associated. A. Neubauer was the first to suggest that the tell be identified with the town of Beth Yerah which was first mentioned in the Talmudic period (8). Gustaf Dalman also accepted Khirbet Kerak as the probable location of Talmudic Beth Yerah. Although this fact would not preclude its identification with Tarichēae, Dalman stated that he had changed his previous conviction on the matter by 1917 and he felt that Tarichēae had to be located north of Tiberias (9). By the 1920s the acceptance of the ancient name of Beth Yerah for the mound known as Khirhet Kerak was growing. Both Albright and Sukenik accepted this hypothesis and both rejected the identification of Khirbet Kerak with Tarichēae (10), locating it as did Dalman north of Tiberias. 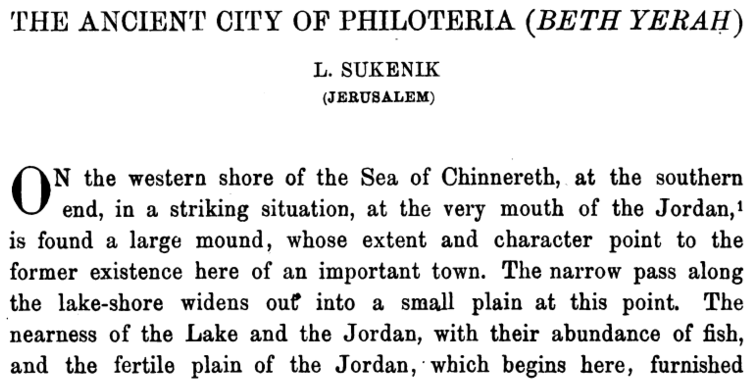 Sukenik proposed to equate Khirbet Kerak with Hellenistic Philoteria. Philoteria was mentioned by Polybius in the second century B.C. Once again this identification would not prevent acceptance of the claim that Khirbet Kerak was also Talmudic Beth Yerah. Beth Yerah is mentioned in the Talmud in tandem with the Roman city of Sinnabris. Sinnabris is generally thought to have been located at Khirbet Sinn en-Nabrah, which is now occupied by the settlement of Kinneret (11). 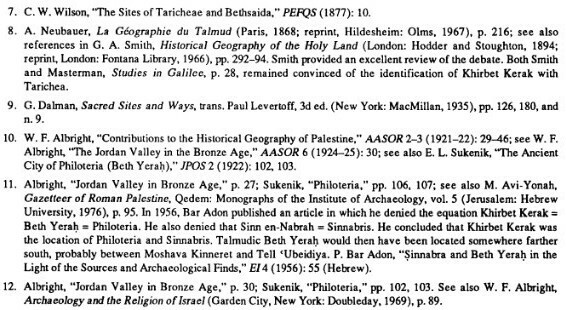 Sultenik goes so far as to say that Beth Yerah and Sinnabris were “sister cities”. The PEF (Palestine Exploration Fund) map depicts Khirbet Sinn en-Nabrah just northwest of the mound of Khirbet Kerak. Their proximity would indeed make them sister cities. Although the evidence is circumstantial the name Beth Yerah has generally been accepted and applied to the site of Khirbet Kerak. Albright explained the absence of the “house of the Moon” in any of the standard historical sources of the Bronze and Iron Ages by noting that there was a gap in occupation at the site from the third millennium until the Persian and Hellenistic periods. 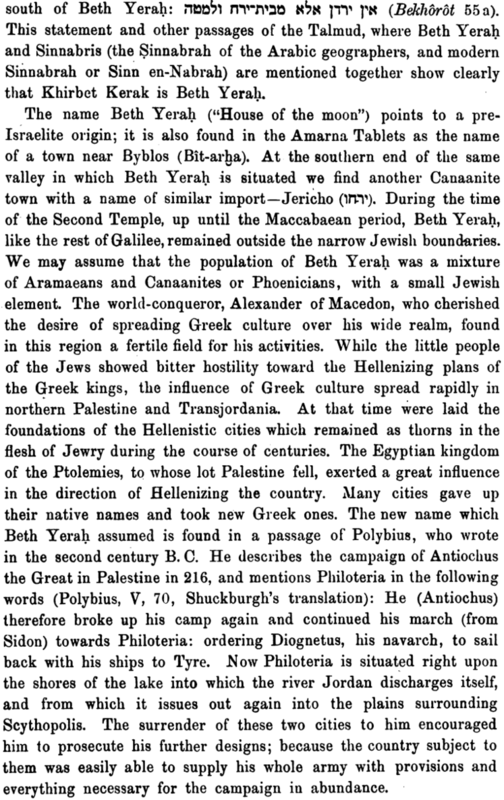 Both Albright and Sukenik asserted that the name Beth Yerah (Hebrew bt yrh) recalled a much older tradition and linked it with Jericho (yrhw), whose name also reflected lunar influence (12). The fixing of the ancient name of Khirbet Kerak and all the accompanying historical baggage that this entails is only one aspect of the definition of the site. The position of the site at the exit of the Jordan River from the Sea of Galilee caused its presence to be noticed and often described by pilgrims and travelers from very early times. These descriptions offer more than simple satisfaction of intellectual curiosity however. Geomorphology indicates that the course of the Jordan has changed and understanding the details of this change can help explain certain archaeological evidence from the tell itself. The first eyewitness account of the tell of Beth Yerah and its position in relation to the Jordan River is that of a Russian pilgrim named Abbot Daniel who described his journey in Palestine in AD 1106. 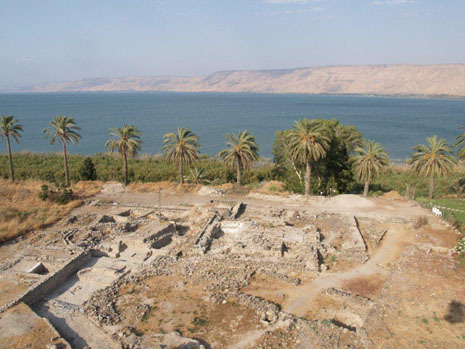 Daniel reports that there were two discharges from the Sea of Galilee. The Jordan flows from the Sea of Tiberias in two streams which foam along in a marvellous way; one of these is called the Jor and the other the Dan. Thus the Jordan flows from the Sea of Tiberias in two streams which are three bow shots apart and which after a separation of about half a verst reunite as one river which is called Jordan from the name of the two arms (13). Despite Daniel’s credulity in the field of etymology he clearly observed the Jordan exiting from the lake at two different points; one north of the tell and the other south where the modern discharge is located. Pococke also mentioned the fact that "Il-Carak" became an island when the lake waters were high. His description of the exit of the river depicts the northern stream for he notes: “Jordan first runs south for about a furlong and then turns west for about half a mile: in this grace between the river and the lake there is a rising ground called Il-Carak ..." (14). Pococke observed a long arched bridge located on the west side of the mound that crossed “marshy ground". On the east there is a large partially artificial plateau which extends from the road to the exit of the Jordan; a broad water ditch from the Jordan and the river itself defends two sides, while it also being on the shore of the sea, thus leaving only a narrower entrance on the west from which it might be attacked (15). 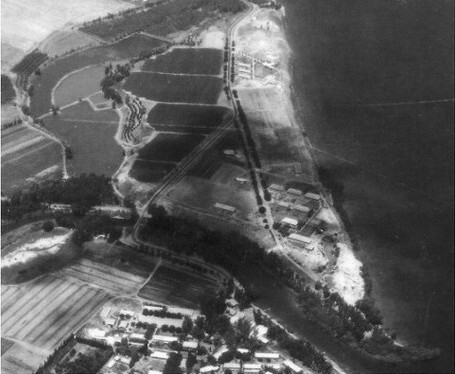 When Picard discussed the geomorphology of the area in 1932 he noted that the barrier connecting Beth Yerah to the shore of the Sea of Galilee was about 100 metres wide and 1 or 2 metres high. This barrier separated the sea from the marshy backwaters of the Jordan which ran along the west side of the tell (17). to its present southern location. There seems to be little doubt that the northern outlet was originally the main one for the river. 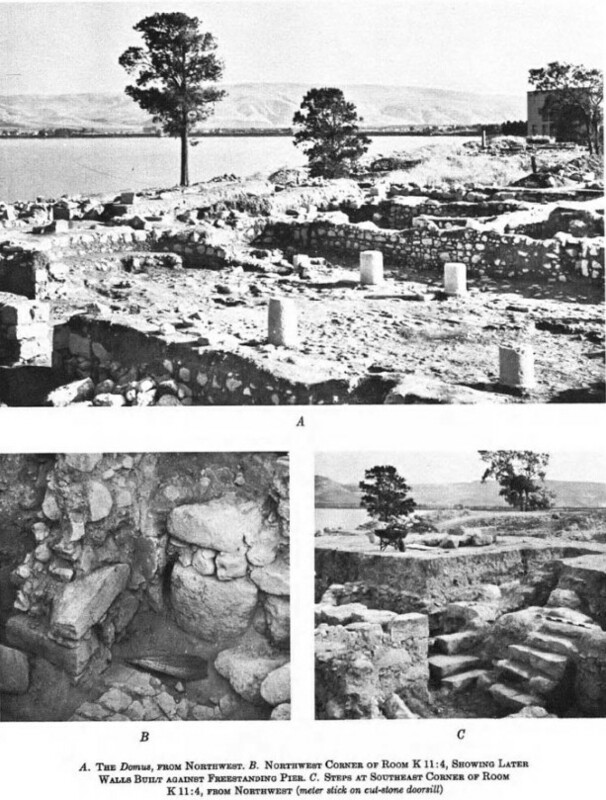 Ben-Arieh assumes that since the "original shoreline of Lake Tiberias lay further to the north, this would mean that the original outlet of the Jordan was also situated on this line" (18). When and how did this new outlet replace the northern one as the primary exit of the Jordan River from the Sea of Galilee? Both Picard and Ben-Arieh suggest that the southern outlet may have been man-made. They assume that a defensive moat was dug along the southern edge of the tell. Once a new channel was cut the old channel would rapidly fill with alluvial soils washed down from the hills to the west. The date of this change of course is elusive. Bar Adon makes a case for pushing the date later than the Byzantine period. He traced the sections of the Early Bronze Age wall and much of the Hellenistic wall along the southern and western side. These defenses indicate a fear of attack from that direction. He also notes that there are remains of a Roman bridge at the foot of the northern part of the site near the cemetery of Kinneret. This would indicate that at least as late as the Roman period the river was impassable enough to require a bridge (19). This is no doubt the same bridge mentioned by Pococke that was still used to cross the marsh in his day. The travelers' accounts, the nineteenth-century maps showing marshes and the Roman bridge all serve to underscore the tenuous link by which Beth Yerah is connected to the mainland. In 1932 a power station that controlled the rise and fall of the lake level was constructed at the outlet of the Sea of Galilee. Before that time however every slight rise in the lake level caused the northern outlet to overflow and the site was almost completely surrounded by water (20). Thus although this shift is difficult to date it appears that at least during the Early Bronze Age the tell was connected to the mainland on the south and separated from it on the north and west. Albright was the first to call attention to the unique style of ceramics found at the site. The easily identifiable characteristics of Khirbet Kerak Ware and its importance in establishing the subdivision of the Early Bronze Age in Palestine as well as providing secure links with Syrian sites have stimulated great interest in the archaeological record of Beth Yerah. Albright collected sherds along the road cut from Tiberias to Semakh and along the east bank of the site where the mound is exposed to the eroding wave action of the Sea of Galilee (21). Albright mentioned a thin stratum of Hellenistic-Roman occupation but he focused primarily on the thick Early and "Middle Bronze" deposits from the road cut. Although he mentions the existence of Middle Bronze deposits his detailed written descriptions of his pottery collection give no examples of any Middle Bronze “fossil types" and in two cases (cooking pots and Yahudiyeh Ware) he specifically acknowledges their absence. His 1926 reference to Khirbet Kerak ware link this pottery with the Middle Bronze tradition and it is probable that at this early stage of Palestinian ceramic study he was attempting to draw parallels between the red polish of Khirbet Kerak Ware and the red burnished ware of the MB IIA period (22). Khirbat al-Karak; Khirbet Kerak is a large archaeological mound located at the exit of the Jordan River from the Sea of Galilee (Lake Kinneret). It has been excavated in a succession of salvage excavations begun in 1933 and continuing into the present. This series of Bet Yerah publications, of which this is the third volume, covers previously unpublished salvage excavations conducted between 1933 and 1986. This volume describes the contiguous Hellenistic and Early Islamic remains excavated in the northern and southern parts of the site and which cover only a portion of the large Bronze Age mound. In 2009 excavation was renewed in the Hellenistic and Islamic remains at Bet Yerah, partly to clarify details of stratigraphy and to complete the documentation of earlier work. In 2012–2013 excavations west of the mound uncovered Islamic-period installations. 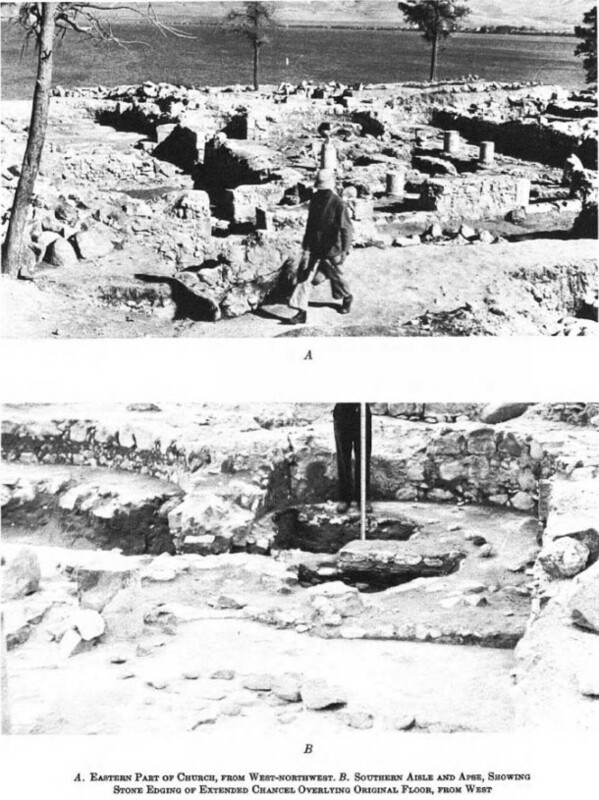 This report therefore includes details revealed in the later work insofar as they are directly relevant to the structures excavated in the 1933–1986 excavations. Substantial Hellenistic remains have been found by several excavators in virtually every part of the mound: in all the areas excavated along its southern side, along considerable parts of the last Early Bronze Age fortification line and in the various excavations of the northern sector. In the central part of the mound evidence is spotty and a few finds were reported in soundings in the western part of the mound. This distribution might indicate a bimodal concentration of houses on the two higher portions of the mound in the north and south with the intervening saddle being perhaps only sporadically occupied. 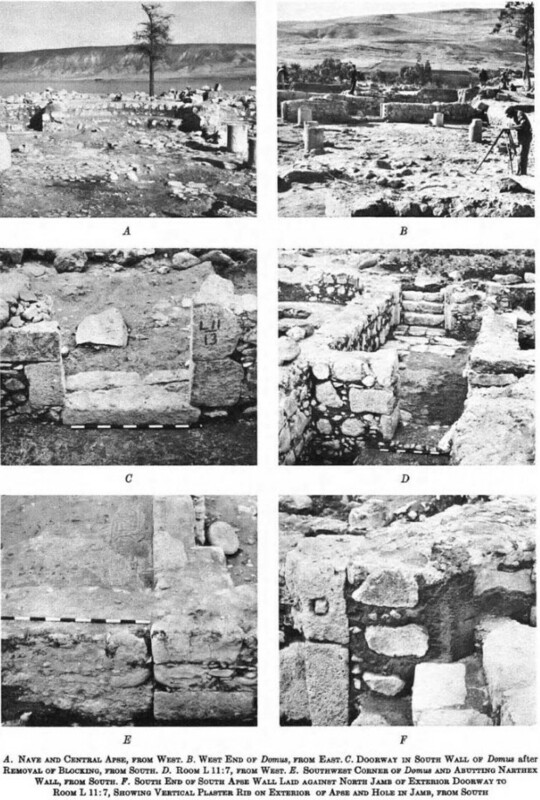 Earlier considerations of Hellenistic Philoteria, based for the most part on the sketchy preliminary publications of the excavation and on chance finds such as a cache of silver tetradrachms (Ancient Greek silver coin) attributed to the site (Baramki 1944) and the later Tyche presumably found in the road cut (Sukenik 1922), had asserted the existence of a fortified town occupying the entire mound (Negev 1976; Hestrin 1993). The attribution of the fortifications to the Hellenistic period rested both on Hellenistic finds made by Bar-Adon within several towers and the assumption that round towers should be ascribed by default a Hellenistic date. However the most recent considerations of the latest stone fortifications supply evidence for an original Early Bronze Age date. 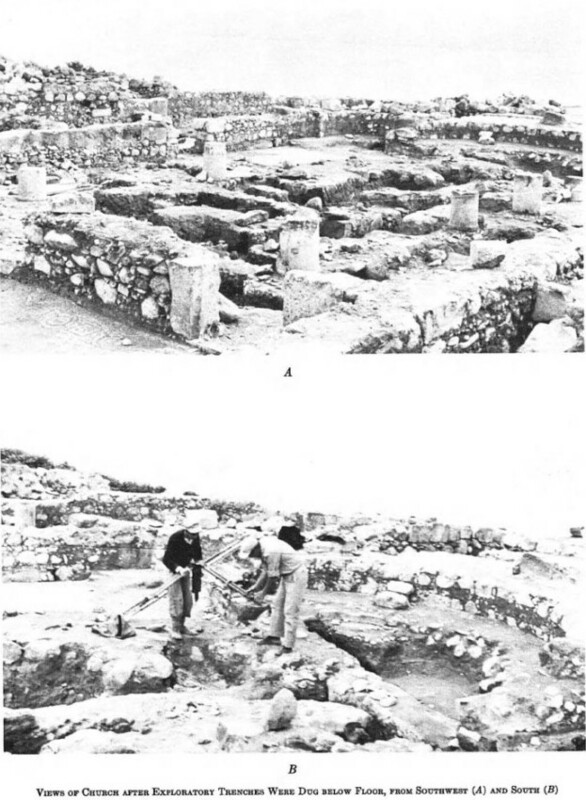 These observations suggest that when Hellenistic settlers first arrived at the site, most of which had been abandoned for two millennia, they found not the gently undulating surface of the modern mound but an uneven surface pockmarked with ruins and with prominent stone foundations of fortifications and of monumental structures. The main concentrations of houses were built away from the massive earlier remains, which were used for refuse disposal and possibly for crafts such as potting (a large pit with kiln fragments was excavated in the Early Bronze Age Circles Building in 2009). Therefore the Post-Hellenistic presence on Tel Bet Yeraḥ was quite limited in extent and did not produce massive deposits. Early excavators reported Roman remains but virtually nothing of this period can be identified in the remaining collections. Byzantine occupation appears to be limited to the church excavated and published by Delougaz and Haines (1960). The same excavators also identified substantial Early Islamic construction above the church; this was associated with the historical Umayyad palatial site of al-Ṣinnabra although it was generally thought that the palace itself was located north of the mound. The written sources on the site in Hellenistic times are relatively scant and refer principally to its foundation and destruction. The place carrying the possibly preclassical toponym ‘Beth Yerah’ was renamed Philoteria in the mid-third century BCE, apparently after Ptolemy II’s sister. Although the earliest reference to Philoteria is that of Polybius (Histories V 70 3–5) in the context of Antiochus III’s invasion of Coele Syria during the Fourth Syrian War (218 BCE), where Scythopolis is mentioned as well; the evidence recovered from our analysis of the Rhodian stamped handles allows us to assume that the site was formally founded [earlier] in the context of the Second Syrian War (260–253 BCE) together with Ptolemaïs -- Scythopolis and possibly Rabat-Ammon (renamed Philadelphia) as suggested by Gideon Fuks (1983:47–51). Regarding Philoteria’s destruction it has long been assumed that the site was taken by Alexander Jannaeus between 104 and 92 BCE, most probably in the same campaign that led to the conquest of Gadara (after a ten-month siege) and Amathus in Transjordan (Josephus Wars of the Jews 1.86; Antiquities of the Jews 13.356; Niese 1955). The only specific reference to this episode is that of the seventh–eighth-century chronicler (Georgius Syncellus I:559 [cf Gelzer 1880:256 ff]) where Philoteria is mentioned at the end of the list of towns across the Jordan (Ἰορδάνου Πόλεων) and in the regions of the Amonnites and Moabites (including Pella -- Gadara -- Abila -- Hippos and Dion). These are said to be Macedonian colonies (Μακεδόνων ἀποικίας) conquered by Alexander Jannaeus together with Scythopolis -- Mallea/Marisa in Samaria -- Mount Tabor and Gaba. The list, which may be derived from the sources used by Josephus (above), is rather confused (from a geographical perspective) and probably suffers from repeated copying and inaccuracies. The stamped Rhodian amphora handles recovered from the larger residential areas could also, or alternatively, be construed as evidence of a destruction (or abandonment) in the context of Jonathan’s military campaign in the Galilee (145/144–144/143 BCE). Various authors have proposed a Jewish and Roman presence at the mound in the first centuries CE based on the identification of the site with the toponyms ‘Sinnabre’ and ‘Beth Yerah’; the former mentioned by Josephus as a staging-ground for Vespasian’s army and both mentioned in third–fourth-century Jewish sources as neighboring towns. Aside from stray finds however nothing on the mound can be attributed to this time-frame. Structures assigned to this phase by Mazar, Avi-Yonah and Bar-Adon have proven to be Early Islamic in date or cannot be dated at all. 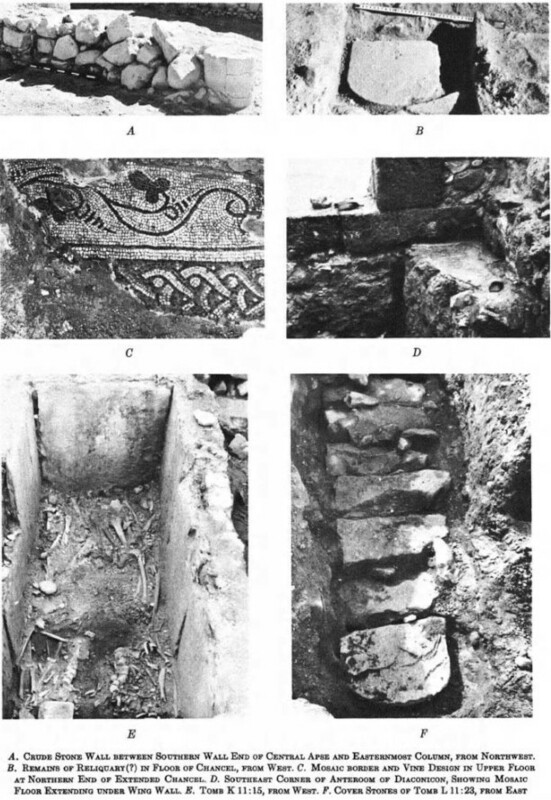 The earliest certain late antique remains are those of the fifth–sixth-century church excavated and published by Delougaz and Haines (1960) and a number of Byzantine tombs found by them on the ridge to the west of the mound (Delougaz and Haines 1960). The location of Roman Sinnabre and even of late antique ‘Beth Yerah’ —- if the later traditions are to be taken at face value —- remains therefore a mystery. In Early Islamic times Sinnabre reappears as al-Ṣinnabra, the local seat of the founder of the Umayyad dynasty, Mu‘āwiya and his successors. Al-Ṣinnabra figures prominently in the annals of Umayyad rule, appearing to have been used continuously until the end of the Umayyad period in the mid-eighth century CE. Later it is mentioned as a village in the Fatimid period but this, i.e. its existence as a village, is not certain as al-Ṣinnabra is mentioned later from Crusader until Ottoman times only in connection to the bridge crossing nearby. The designation Khirbat al-Karak ‘Ruins of the Fortress’ seems to be of late origin (Pococke 1745:70 appears to be the earliest mention in print). In late Ottoman times the mound was crossed by the Samakh [Zemah]–Tiberias road but there is no record of settlement at that time. The name Bet Yerah is a recent identification possibly based on a Bronze Age toponym.